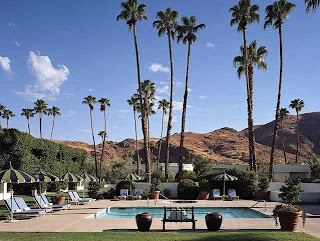 With an onslaught of friends and acquaintances flocking to Palm Springs (yes that's you Eddie Ross & Therese of La Dolfina; read about her amazing visit here) to take advantage of it's picture perfect April temperatures, I'm squirming with jealously. If you've been following DT for a bit, you know that Palm Springs is one of my favorite places in the U. S. For the sun, sure, but it's the architecture and the history that had me at Highway 111. For those that have been blogging long, we've seen a plethora of Palm Springs posts with the trend evoking designs of Kelly Wearstler, and Jonathan Adler. 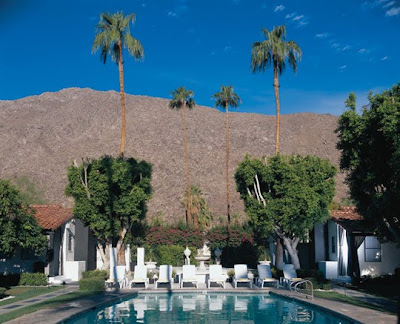 We've seen the modern post-war architecture of John Porter Clark, Rudolph Schindler, Quincy Jones, Richard Neutra, and Albert Frey (to name a few) - It was Clark and Frey who were the first modern architects to live and practice in Palm Springs who arrived in the late 30's. In the mid-40's came architects E. Stewart Williams, William Cody. 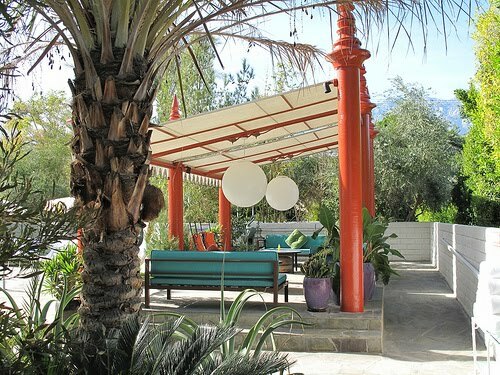 who have been recognized as 'setting the tone' for the practice of mid-century modern architecture in Palm Springs. It was in the 40's that the advent of air-conditioning changed the arid, sparsely populated California desert at the base of Mt. San Jacinto, to a viable destination spot for the second homes of the post-WWII leisure class and most recognized, the rich and famous of Hollywood. 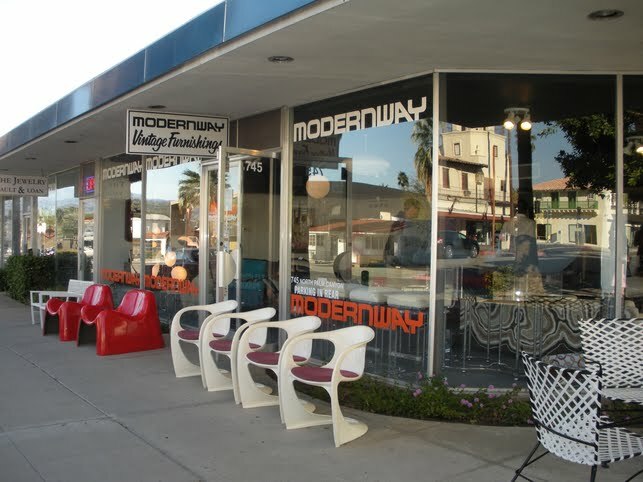 The next decade came the birth of Palm Springs Modernism; repeatability. 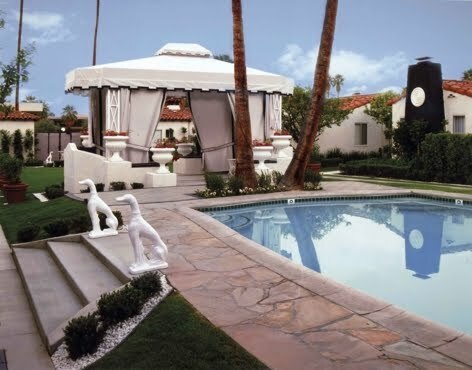 Authors Andrew Danish and Alan Hess of the book 'Palm Springs Weekend', described modernism as being 'embedded with the ideal of mass production'. "The repeatable object". There are a few names that shine as being beacons of 'California Mass Market Modernism' in the 50's' such as Eicher, Meiselman, Wexler, and the father and son team, the Alexanders. The Alexanders are famous for ushering in the era of mass housing in the late 50's with 39 houses in the Twin Palm area. They changed the face of the desert creating a simple, functional modernism with home-life in the California desert. You would likely recognize the homes built by George and Bob Alexander and designed by architects Dan Palmer William Krisel as the 'butterfly roofed' houses; this is for their sweeping winged-typed roofs (read about the butterfly roof here from fellow modernist lover the Cottage Cheese). Team Alexander built over 2500 houses in Palm Springs alone from 1955-1965 when the entire family (minus one daughter) perished in a tragic plane crash. 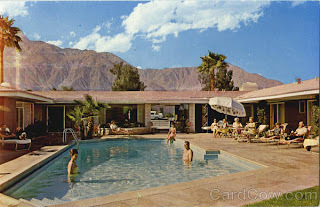 As you view the following images of structures, the views and life-style of Palm Springs, remember that this desert aesthetic has been blogged, written, photographed and filmed more than most over the decades. 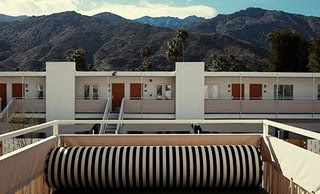 Take note that Palm Springs has a past that speaks volumes to a small desert town that had the most important concentration of modernist architecture by some of the worlds most distinguished architects; which ultimately became the true oasis for progressive design and a city of eccentrics and mavericks. 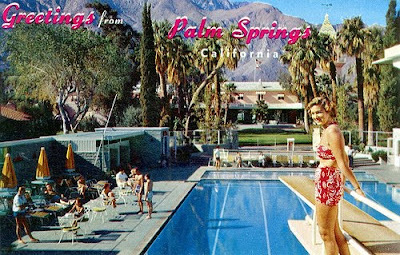 What we would of missed out on if Palm Springs had not evolved? Hersey bars,and graham crackers. Any one else for smores at the Parker? 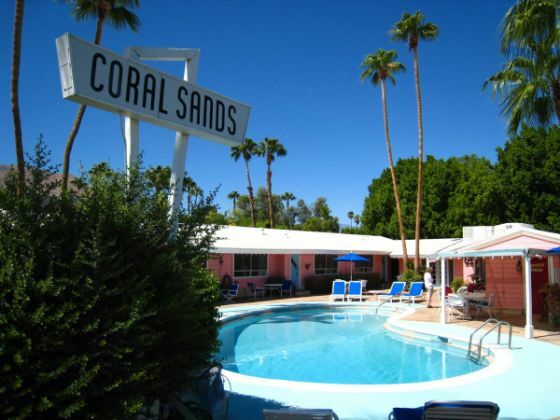 Ruby Montana's Coral Sands Inn built in 1952. Book a night in this retro motel here. Pet's accepted. for a huge number of historical modern houses for rent. is a great list of where to begin and end your rummage. ** a profound thank you for all my new readers and faithful followers. I appreciate each and everyone of you. I must apologize for my lack of reading & commenting on your tremendous posts. Between now & July, life is in star wars type warp speed. Just know you are always thought of & will do my very best to keep up with all your news. Hi there! So where is that picture of the little cottage that is above the girl sunbathing from? I love Palm Springs. Fun post. Palm Springs is definitely on my list of "must visit" places in the USA -- though I think I'd probably enjoy it more as a girls' trip as Dave isn't much for shopping, oogling gorgeous hotels, etc. Save me a spot around the campfire at the Parker, Deb! wonderful images of that fantastic place. never been there but would love it if it even remotely resembles the beauty you have shown today. thanks! Hi Full House - the small cottage is actually on the grounds of the Viceroy. Cute isn't it?! 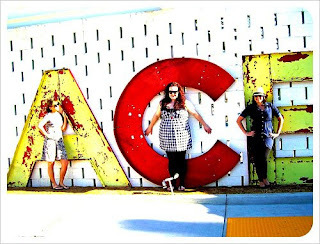 A Perfect Gray - you must go, a girls weekend with Averill of Odi et Amo is in order. Averill - Can you image the fun we'd all have? Smore's it is! i love this post. 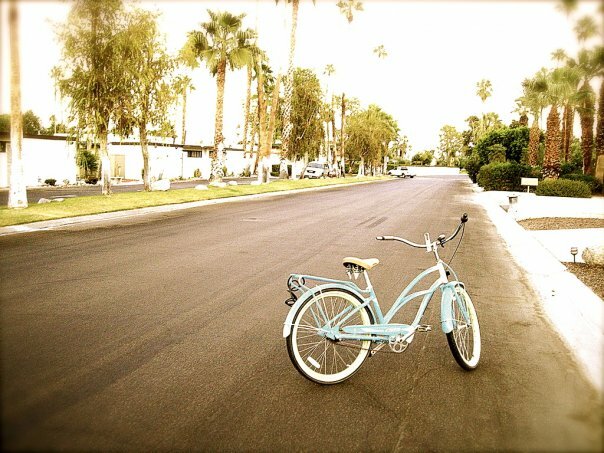 palm springs is my second home...and might be the place i could live forever. perfect vacation spot!!!!! great write up about it. 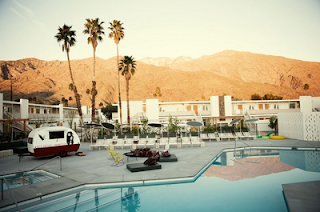 i want to go to palm springs soooo bad. pimm's cups at the parker darling. you, me, and our caftans!! Deb, for a moment there, I thought you were in California with La Dolfina! OMG, this post has my lady parts all a twitter. California Dreamin', Your Kitty! Only Sanity Fair would notice that! Brilliant! that weekend was so much fun that i could never make it public. no one writes a travelogue like you, girl. just got back from Vegas (signed another act), and even though i started a website called LuxeVegas.com, I found my stomach turning with what a dump of a town the place really has become. 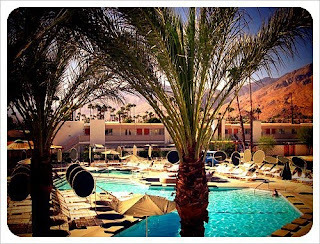 it is bankrupt beyond belief (morally and financially) ... i'll take palm springs everyday over vegas and 2x on sunday. 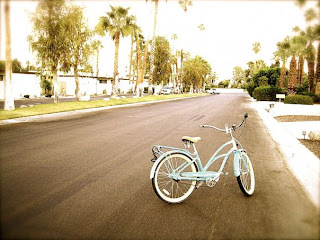 I am yet to visit palm Spring...it seems I will never get out of the insane time warp, stop for a moment, take in the sun and the beauty of the world...Thank you, thanks to your post i just did that. but seriously. Sitting by a pool either in the desert or on the beach with fresh fruit and drinks coming my way sounds like Heaven right about now. interesting history/photos' too. I have been to Palm Springs/Palm Desert once, but it was in 1998. Seems like forever ago! Fabulous post as usual, Deb. There's nothing quite like Palm Springs is there? 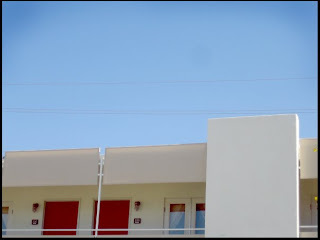 50's architecture is so distinctive! And familiar. I'm aging myself here, but I grew up in a house built in the early 40's that had that flavor. It's still there too. That red bathing suit? I had one. Good Lord. What a superb post!! Can't wait for Part 2!! What a journey through Palm Springs. I think that we passed through when we were in Calafornia. Next time we must stop...I don't know why we didn't last time. We probably had some deadline or other!! Fabulous photos of living in the sun....and, you know that it's me in the photograph by the pool, Deb !! haha. Hope all's well with you and yours and you're sorting everything out. Will be in touch soon. Well thank you so much for this course in all things Palm Springs. It was so interesting to read and look at the pictures. Forget wanting to just go home after work today.... I want to go to PALM SPRINGS!!! Girl, where did you find all these fabulous photos! They sure did their job. Beautiful post. You really did a nice job, I was there in the 80's. I guess I just don't like the desert. I been to Vegas, Had a great offer to move there. NOPE Now, Reno was not to bad. I like the coast. Love the smell of the ocean. Palm springs has changed, from your post. I just want to jump into those photos. GORGEOUS! such a distinctive style & culture! Darling I have a list of 100 things i want to do before I die, and visiting Palm Springs in currently somewhere between 56 and 70. Just like Leigh.. 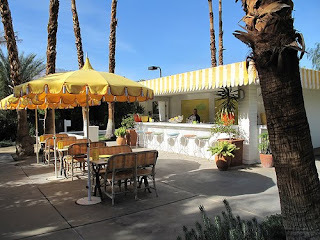 I knew very little of Palm Springs before this post.. Well maybe not true.. watch too much television and movies!! haha But it certainly made the 50's look good!!.. By the way I wish 'That's Me' was me also!!! as long as 'me' comes with private pool and cabana!!! 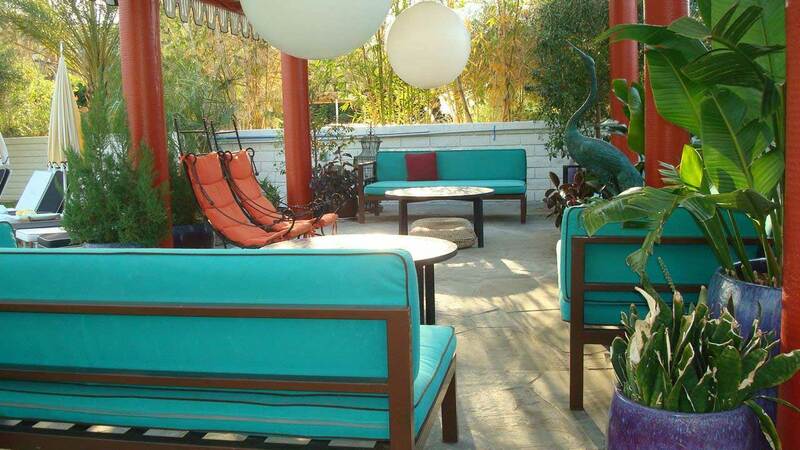 i really want to go there... never did when i lived in LA and now that i'm not there anymore want to go really badly! I've never been to Palm Springs, but now I want to go. It looks fabulous and I don't even want to think about the temperatures [sigh]. 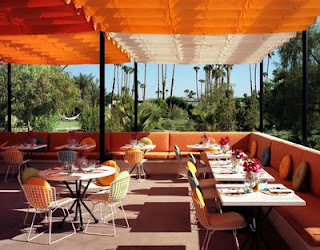 I need a trip to Palm Springs! That dog is like my bella, I love that picture! I wish you were on the bus tour with us, you and our tour guide would have been a dynamic duo!! I love seeing and learning about things through your eyes and mind!! You must come with us next year... This is a sincere invitation! @Dumwit Tellher thanks you! just stopped by your blog...very cool! a follower now! 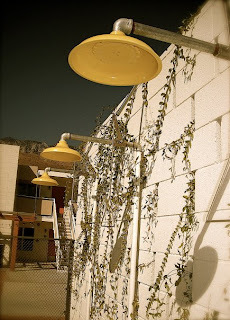 ... love love ACE Hotels..hope to stay in one sometime.. have a wonderful weekend! I could pack right away! To stay in the Viceroy hotel! Woouuw! PS Thank you for stopping by Deb! 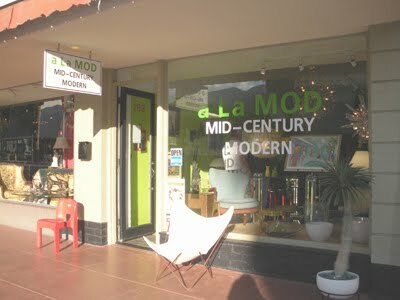 Thank you for evolving Palm Springs! It's true, we would have missed out on alot! Everybody on the East Coast is thinking, What about Miami! Deb, I was in Palm Springs & Palm Desert (better) 2X in the last couple of years. I'm like Yvonne, and don't like the high desert arid landscape at all. If one plays golf and can be there ONLY during the winter, maybe. Your retrospective of this little town is lovely and nostalgic. I prefer Santa Barbara. Divine. One of my best friends in the States just returned from P.S. where she claimed she did not wish to go, but "had accepted an invitation months ago," upon her return she reported she had the best time she's had in years. That's say a lot considering her life in general. Loved your expose and I'm sure that is a picture of you and you're simply modest. I love the advice, "shop responsibly" -- truly lol. 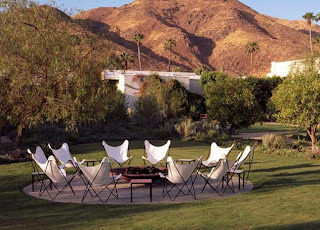 Deb, and Averill - how great if we could all meet up in Palm Springs for a weekend? 2011 looks good for me! Fabulous post, as usual. Has me drooling over my keyboard. Hope you're having a wonderful weekend! Hey there--I guess I need to make a trip to Palm Springs! You make it impossible to resist. Thank you for visiting and for your awesome words of encouragement! 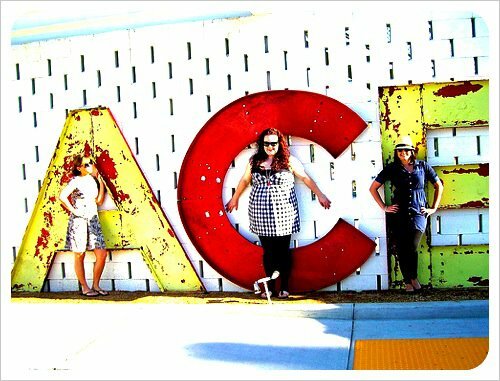 Love my bloggy friends! I've never been - but you know how to entice. I bet travel agents would love this post! oh I am so there, Deb! I don't know much about Palm Springs, admittedly, as I have gravitated toward Miami (East Coast girl syndrome, I suppose). These pics are delightful! I need to head south for the swinging regency style that seems to have been born at the Viceroy - that place is so luxe! I've never been to Palm Springs, but looking through these pictures, I feel like I've been there :-) As soon as I read "butterfly-roofed" house, I knew exactly what style you meant. Thanks for the link to the pics at The Cottage Cheese. 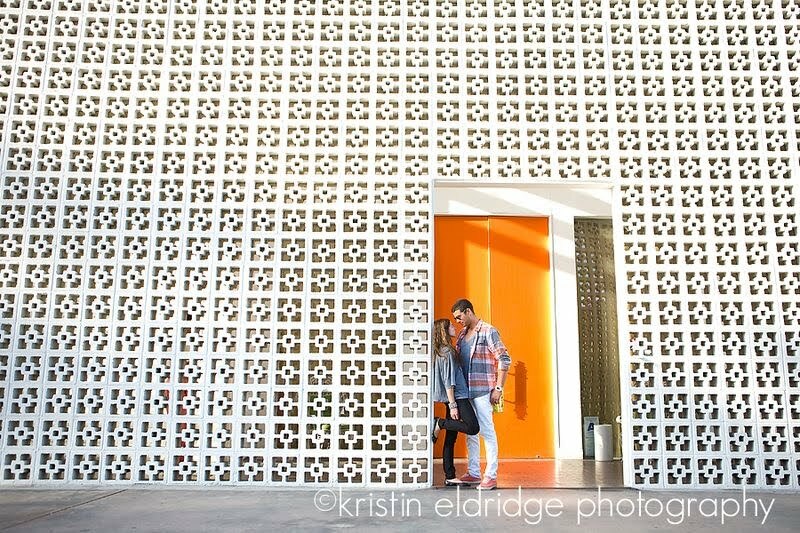 I love that intricate white wall at The Parker :-) I popped over to the Parker web site to see more -- wowsers!! I need a weekend like Renee's at The Viceroy. was just there! great pictures! Okay, this is such a fun post. The text is great and the images are drool worthy! The name of your blog is PERFECT - I am SOOOOOOO dating myself when I say my Mom used to buy all of our clothes there! Glad to have found you! Love your entire site. Come visit over at ours- I think we're think on the same page. Wonderful images. Keep sharing more posts.